Everyone has big dreams. But why is it that so many people fail to make those dreams a reality? It’s not because they’re physically or mentally incapable of doing so. And it’s not because they lack the time or the money. The sad reality is, most people fail because they lack the confidence and belief in themselves required to succeed. That’s the one big factor that separates the winners from the losers: BELIEF. When you believe you can do something, you will. It’s that simple. You know the goal is within your reach and so you’ll do whatever it takes to bring about your desired result. But when you believe that something is impossible, you won’t even bother trying. Why would you, when deep down you believe your efforts will be wasted? That’s why confidence and self-esteem play such a huge role in determining your level of success. The more confidence you have, the more risks you’re willing to take – and the more risks you take, the more chances you have of success. 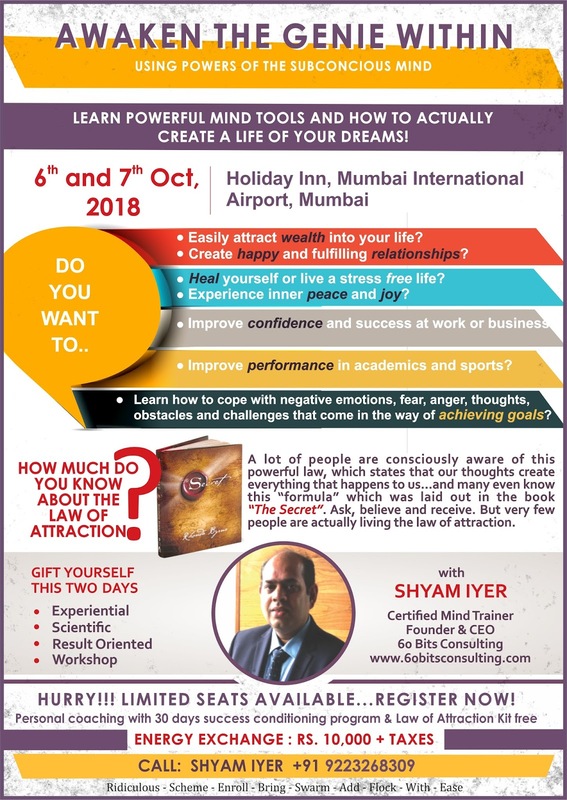 So if you want to achieve big goals and create the life of your dream, my biggest piece of advice to you is work on building your self-confidence. Because once you cultivate an unshakeable belief in yourself, you will be able to accomplish anything you can imagine. 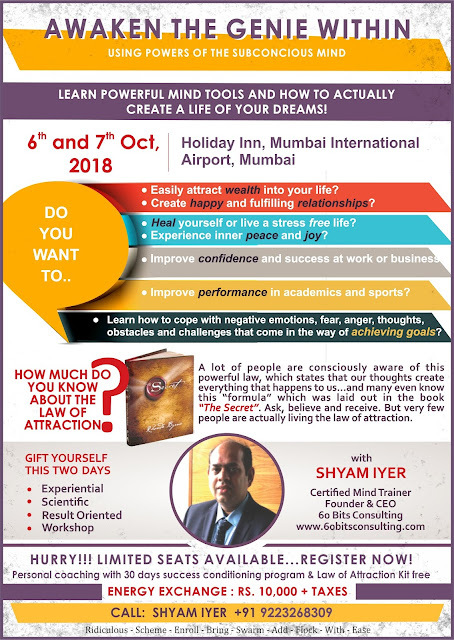 In our two days signature workshop “Awaken the Genie Within” on Oct 6th and 7th at Holiday Inn, Mumbai, you’ll learn mindtools and techniques to help build your self-confidence and achieve the life you’ve always envisioned for yourself. Remember, it’s your responsibility to take charge of your own self-concept and beliefs. You must choose to believe that you can do anything at all—because, in fact, you can.